First, we ran them through our SEO Setup Process and started a monthly SEO Maintenance plan - and sales really took off. Six months later, they came to us and asked, "What's next?" Their old template website didn't look very professional and couldn't even open on mobile devices, so we designed a beautiful, custom, Responsive WordPress website -- and that's when things really boomed. 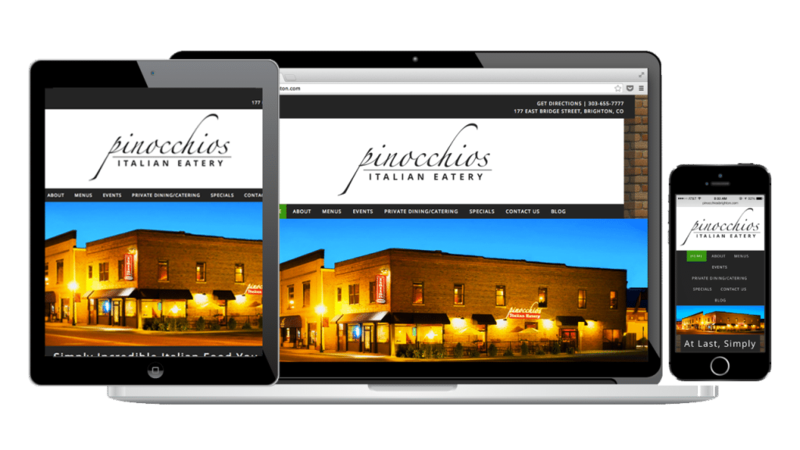 After launching their mobile-friendly website, their rankings in mobile search results really took off, and more importantly, their new website made it easier for prospective customers to interact with their brand, read their menu, and ultimately call them or get directions to the restaurant. SEO and good design can drive sales for a local business. For Pinocchio's, we're thrilled that they can attribute a 16.7% increase in revenue to our work. See our other case studies, and contact us for a Million Dollar Marketing Meeting!